Sarena Shasteen has been an avid health food and fitness enthusiast from an early age. She holds a degree in Culinary Arts from The Art Institute of Atlanta, a certification in Fitness Nutrition and is a certified Fitness Trainer from International Sport Science Association (ISSA). Sarena enjoys helping others reach their health goals by teaching them that health and fitness are not only achieved in the gym, but also through fun everyday activities and good nutrition. She formerly wrote the blog The Non-Dairy Queen and is now the Social Media Coordinator for Bob’s Red Mill Natural Foods. You can find Bob’s Red Mill on Instagram, Facebook, and Twitter. 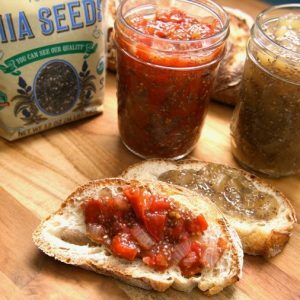 Chia seeds can seem intimidating to begin with, but once you get to know them and understand not only what they have to offer you nutritionally, but what they can do for you in the kitchen, you will start adding them to everything… like this chia jam!